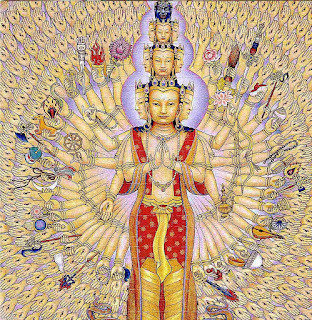 Today I am contemplating the image of the 1000-Armed Chenrezig, the Bodhisattva of Compassion. He has 1000 arms to better serve all the millions and millions of suffering beings. I didn't stay up to watch the election results (I couldn't) but all night long I could feel the pain of millions of other people and feel it even more so now: Confusion. Fear. Shock. Betrayal. (The challenges of an empathic life are that you feel EVERYTHING). I'm reminded more than ever that we are still in the Kali Yuga--the "degenerate" age. Those of us who are lightworkers and truth-tellers and earth-protectors and heart-openers and consciousness-raisers and wisdom seekers and dharma teachers and Christ Consciousness-raisers and Way walkers, yogis, Khalsas, mystics, sages, animal rescuers....this list goes on...those of us who are somewhat awakened simply have more work to do, starting now, to help others awaken. 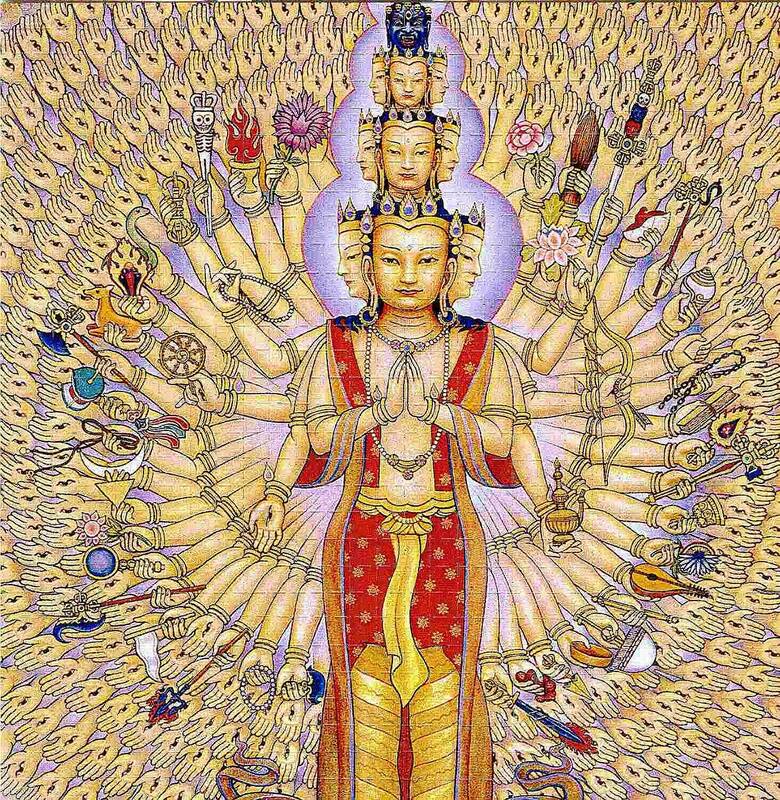 I keep staring at the 1000-Armed Chenrezig: look at what he holds in his hands: lotus flowers, musical instruments, malas. It's clear that most people in this country believe we need guns, walls, hatred and Otherness to protect themselves from their own fears. But let's continue to create a new kind of super-hero, which is actually a very ancient one. Let's just keep loving everyone, serving everyone. We have many Great Ones on our side. We are the sparks of the great flame. Keep igniting! I am an author and musician who divides my time between New York City, upstate New York and (in the winters) various warm places. My memoir “Rex and the City: True Tales of a Rescue Dog Who Rescued a Relationship” (Random House) was hailed as “the best human-with-dog memoir you’ll ever read.”(An expanded eBook edition of RATC is now available). Forthcoming books include two novels; a memoir about my experiences living in a tent at a Buddhist retreat center; a young-adult fantasy series (which seems to be writing itself at the moment); and Volume II of “Rex.” I am also a vocalist and am currently recording a companion CD to "The Expatriate’s Guide" with songs based on characters from this novel.I’m also a kirtan walli and lead chants from the Hindu, Buddhist, Sikh & Native American traditions. I just started recording my first kirtan CD with beloved producer Gaura Vani Buchwald. I feel blessed to be able to do what I love and aspire to give back to the world. 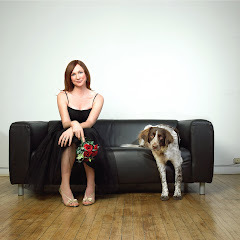 Thus,I always donate 10% of book proceeds to animal rescue.